I remember the chocolate covered malt balls (Whoppers) of my youth being pretty darn good. Somewhere in the midst of my getting old malt balls- specifically Whoppers stopped being good. I place the blame for this firmly on the inclusion of mockolate. When I was doing some shopping at my local Brit store the sales lady told me these were her favorite- AND they still contain real milk chocolate so how could I resist? First, a closer inspection once home of the label revealed that while the chocolate coating does include both cocoa butter and cocoa fat it also contains the evil hydrognated vegetable fat. UGH! WHY?! Whining aside I will give it points for tasting more like 100% real milk chocolate then the coating on it's American cousin the Whopper (well maybe Step-Cousin would be a better comparison. While Hershey's makes Whoppers here, in the UK it is a Mars brand). It's cool on the tongue. It's waxy and doesn't so much melt as slouth off from the heat in your mouth. The coating it's self was just the right thickness. What I really liked about the candy was the malt center. If our version of a Whoppers center is dense has more of a vanilla taste to it, these are light and airy. They melt in your mouth. If you have ever had a real malted shake or even just added malt powder to milk, that is exactly what the center tastes like. There's almost a honey taste to it. I liked these enough to get them again! 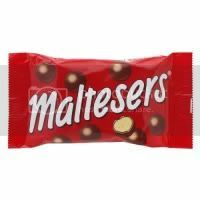 Labels: Candy, Chocolate, Imported Candy, Malt, MArs, Milk Chocolate, U.K.
Man these are soooo much better than Whoppers! So unfulfilling though I could eat them non-stop! These ARE Good!! If you like UK Candies, you should really try Curly Wurly and Topic Bars!